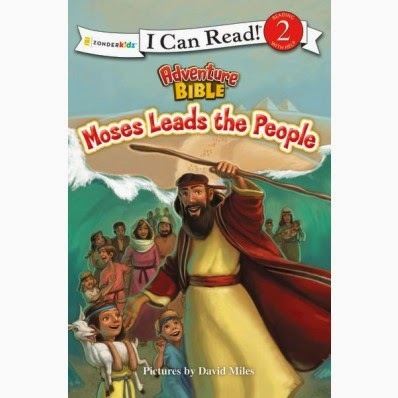 This I Can Read level 2 allows a student to read with help, the great story of Moses leading his people out of Egypt. Beginning with the burning bush, God calls Moses to help free the Israelites from captivity. Aaron goes along to help Moses and they approach Pharaoh asking for the Israelites to be freed. Of course we know the story, and it takes 10 plagues before Pharaoh tells Moses to take his people and leave. There are some tough words in the story.. Israelites, instructions, convince, Pharaoh.. this is probably why it is rated a 2, needing some assistance. The illustrations are great and patterned after the Adventure Bible. Be sure to check out the other great I Can Read books in the series from Zonderkidz!